The “Container Baby Lifestyle’ is a term used to describe a baby that spends majority of their time in a container. Containers include car seats, bouncy swings, vibrating chairs, Bumbo seats, exercisers, etc. Container Baby Lifestyle may cause plagiocephaly, or flatness of head, since the child is positioned in the same posture for a long time. In order for your child to develop appropriate gross motor skills, they should be spending more time on the floor than in a container. Floor time, especially tummy time, is crucial for a child to explore their environment and build arm, trunk and leg muscles. This article focuses on physical therapist’s concerns with popular baby containers, and provides alternative options. Since 2008, Bumbo seats became a popular seat for infants and toddlers. Our physical therapists highly discourage the use of Bumbo seats for various reasons. Bumbo seats are marketed to assist infants in sitting upright before they are able to on their own. In reality, the Bumbo seat hinders the natural progression of motor skills needed to sit upright. Children need a variety of developmental positions in order to gain head and trunk muscles, but the Bumbo seat places babies in an unnatural position inhibiting those positions. — Cube chair:They allow your child to sit higher or lower (depending on child height) to ensure the child’s feet touch the floor. This adds stability to their body while sitting so they can play, eat, draw, etc. — Kids table and chair: Allows stability while sitting since their feet can touch the ground. The table is great for mealtime or crafts. 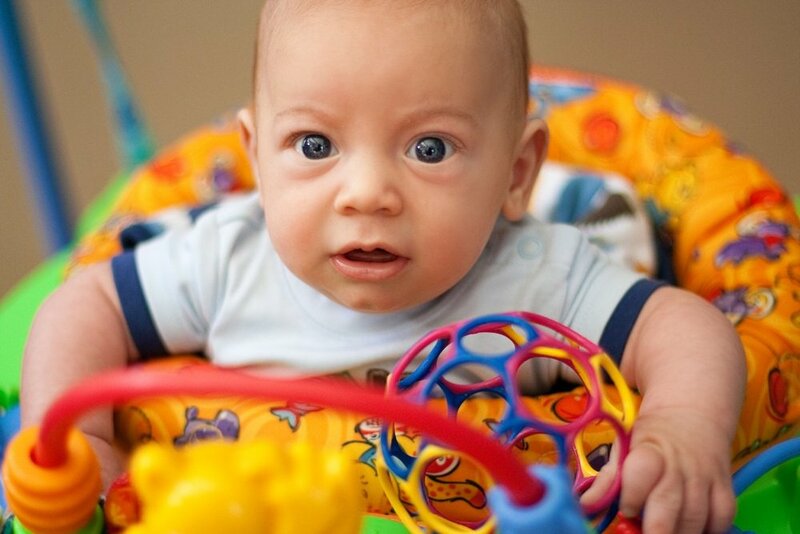 Exercisers are seen as a safe place for babies to play while parents can complete a few chores. The problem with exercisers is it holds babies’ hips in an extended position. The child is not properly gaining core muscles since their back is arched and tummy is forward in these exercisers. It also deprives the child from looking at their feet, which is necessary visual feedback while learning to balance. A child may become a toe walker due to poor standing while placed in exercisers. Jumpers are similar to exercisers but they allow for even more movement and jumping. Jumpers have many similar concerns as exercisers. Also, when babies are in jumpers they tend to jump forcefully which discourages the slow, controlled movements necessary for walking. Both jumpers and exercisers are giving the lower half of the body an ability that the upper half of the body is not yet prepared for. It is reversing the normal development of trunk and arm control before strengthening the leg muscles. If eliminating container play is unrealistic for your family, try to minimize the amount of time in a container to 15 minutes a day (maximum 30 minutes). Babies should never be left unsupervised in equipment. A safer alternative for immobile babies would be floortime. Babies who are mobile, a playpen or fence would be appropriate. A high chair can be another safe option while you are cooking so the baby is seated in a 90-90-90 position (back against back rest, feet on foot rest, and thighs parallel). Place toys on the tray for the child to maneuver while sitting. For more information about containers, read our blog on Limiting Container Play. If you are concerned about your child’s gross motor develop, contact Lumiere Children’s Therapy for a consultation with one of our physical therapists.